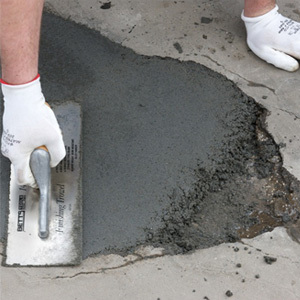 Capital Industries is a leading supplier of concrete repair products. See our product list below and contact us at (631) 298-6300 for a quote. KWIK-BOND is a premixed, 100% solids polyester resin based compound. It provides high early strength with negligible shrinkage. KWIK-BOND cures hard, yet not brittle, and bonds securely to all concrete surfaces. As KWIK-BOND is moisture insensitive, it can be applied to damp surfaces. With its built in flexibility, abrasion, and corrosion resistant properties, KWIK-BOND is an excellent patching and resurfacing compound that can be feather edged. KWIK-BOND is USDA approved for use in federally inspected meat and poultry plants. KWIK-BOND is designed for concrete floor repair on frozen surfaces such as freezers, coolers, and holding boxes. KWIK-BOND will set up and cure without the need to raise surface temperatures, use propane torches, or heating lamps to accelerate the cure. KWIK-BOND can be used anywhere a quick set is desired, in any temperature range. KWIK-CRETE is a very rapid setting, advanced urethane formulated, high industrial strength, ultra low viscosity concrete crack repair and concrete floor repair material. KWIK-CRETE is a two part, 1:1 mix ratio by volume, 100% solids system. It is 100% solvent free and VOC free. 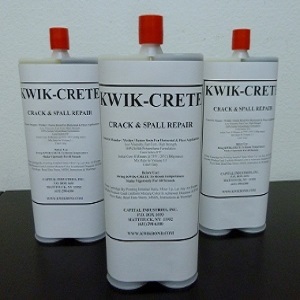 KWIK-CRETE is designed to repair spalled concrete floors, surfaces and cracks, and to rebuild damaged control joints effectively and quickly. REPOX-MIX is a three component 100% solids epoxy resin base compound. It provides high early strength with negligible shrinkage. REPOX-MIX cures hard, yet not brittle. It bonds securely to concrete, metal, wood, brick, and other solid surfaces. REPOX-MIX is USDA approved for use in federally inspected meat and poultry plants. 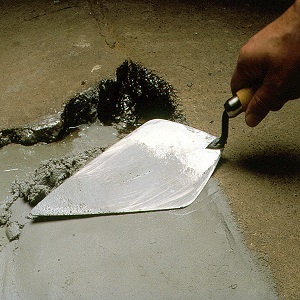 REPOX-MIX is a unique and complete premixed epoxy mortar. Usage is simple even under the most extreme conditions. When mixed, REPOX-MIX provides a high strength patching mortar which can be featheredged. REPOX-MIX is unique in its ability to bond to damp surfaces. Thus REPOX-MIX may be used outdoors or on slabs where it is difficult, if not impossible, to get the surfaces absolutely dry. Complete with aggregate, nothing else to add. Scientifically designed to fill in and resurface concrete, brick, metal, wood, and any other solid surface such as concrete curbing and concrete steps. REPOX-MIX can also be used for anchoring equipment, posts, meters, and signs. POLYFLEX is a 100% solids, two component, moisture insensitive epoxy. POLYFLEX is formulated polysulfide free to resist damage from wheeled traffic and stress vibrations. POLYFLEX is specifically designed as a concrete crack filler and sealer for narrow masonry grooves and expansion joints. 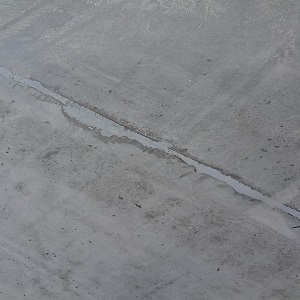 This self leveling, flexible epoxy exhibits tremendous adhesion to concrete, which reinforces the joint, thus preventing deterioration of edges. POLYFLEX can be used for saw cut control joints, grooves and masonry joints to protect against water damage, corrosive materials and dirt build-up. KWIK-FLEX is a unique and complete expansion joint and concrete crack repair material designed for use in low temperature areas or anywhere a quick set is desired. KWIK-FLEX cures to a high strength, resilient, and long lasting seal in just 60 minutes. KWIK-FLEX can be applied under low temperature conditions without the usual need of heat lamps or propane torches. KWIK-FLEX remains serviceable to -60°F. 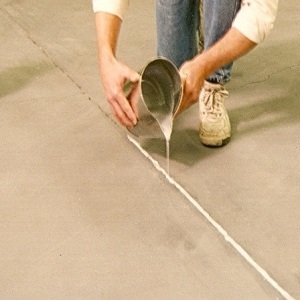 KWIK-FLEX may also be used for slip joints or as a crack filler. 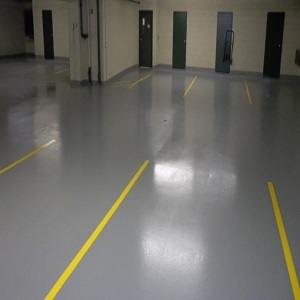 REPOX-FC is an advanced formula two component epoxy polyamide coating system designed to provide a heavy duty gloss finish to concrete floor areas. REPOX-FC imparts a chemically resistant, hard, durable finish not attainable with conventional resin material. REPOX-FC is supplied as a two-component system with extended pot life. This permits a unique 8 hour application period after mixing. REPOX-FC will then cure to a full gloss finish. REPOX-FC is available in a wide variety of custom colors.